Download the My Disney Experience App – You can link all of your park tickets, meal plans, reservations, experiences, fast passes, credit cards, and Memory Maker photos in one place! Magic Bands – These are a lifesaver! One band that will open the door to your resort room, link a credit card, keep track of your park tickets, fast passes and meal plans, and log all of your Memory Maker photos. It’s amazing what one little waterproof band can do! The Memory Maker photo deal is one of the best things going! If you purchase it in advance, it is $149. If you wait until you arrive on property, it is $199. This may be the best money we spend on our trip. There are photographers everywhere and they will take your pictures, scan your magic band and the pictures almost instantly appear on your My Disney Experience App. I highly recommend this!! Character Dining – If you book a breakfast before the park opens, you will gain entry to that park early. This was great to get into the park before the crowds and take some amazing photos with the iconic castle, sorcerer hat or giant golf ball without hundreds of people in your photos! Another plus is when you see characters at meals, they come around to your table, sign autographs and pose for pictures. This alleviates waiting in long lines to see them in the parks. The kids weren’t interested in waiting in line to see the characters they had just had breakfast with. What a great way to manage the time during the day! Let’s face it, at Disney you spend enough time waiting in line, why not cut out a few character lines! Strollers – If you have children with you, you need a stroller. Disney is extremely stroller friendly. 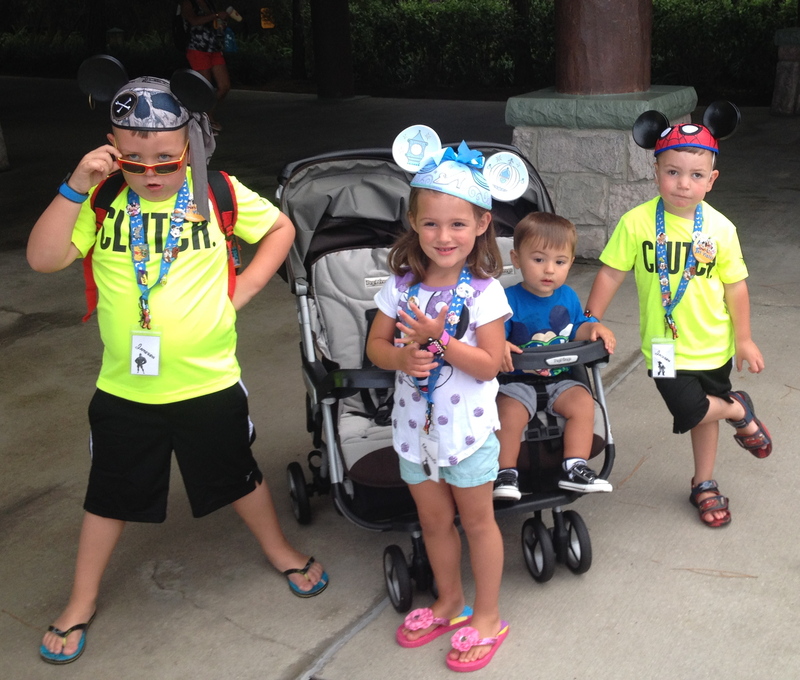 There is plenty of stroller parking and a great rental system in the parks. My kids are too big for a stroller at home, so we rented a double one at the parks. I’m so glad we did. These durable, efficient strollers were a lifesaver! It gave the kids an opportunity to rest and provided plenty of time for them to sit and drink water – a much-needed respite during the August heat. At night, the strollers were a necessity. When there are thousands of people trying to get around the Electrical parade and the fireworks at the Magic Kingdom, knowing my boys were safe and accounted for in the stroller gave me piece of mind that could not be duplicated. Some people abandon their level-headedness and manners at the gates when they enter the park. They simply don’t care who or what they are running over. Watch your little ones and your toes. A stroller is the best bet for both. Your kids are safe and your toes are most likely out of reach to other strollers and crazy people! Bring your own glow stuff – For $5 I purchased a huge package of glow necklaces. This kept the kids entertained for almost an hour each night as they put them together and changed from bracelets to necklaces. It was also a great way to find everyone when the lights went out for fireworks. When you’re at the parks at peak time, getting ready to watch the night-time shows and the lights all go out, there’s a little sense of panic that rises on the back of you neck when you are not physically touching your child. 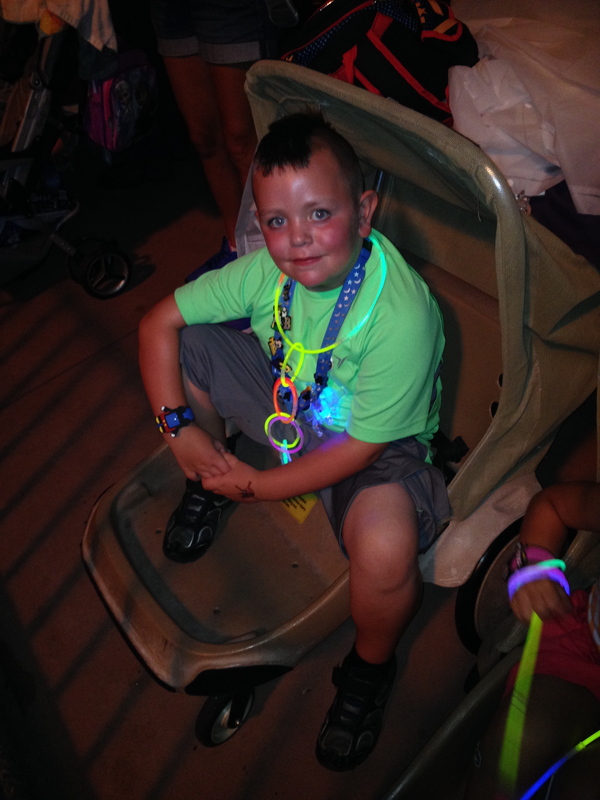 These glow necklaces eased my fears and ensured that we were all together at the extremely-crowded nighttime park exits. Fast Passes – Sign up for them. We booked fast passes for the more popular rides around our dining schedule. It could not have gone more perfectly. I think my children were spoiled, as we did not wait in any line for the first three days. We waited in one line for over an hour and while the ride was fun, it was not worth the 60+ minute wait. Planning ahead makes the day go that much smoother and you get to see much more of the parks. You can book up to three fast passes through the Disney Experience app at one park per day. Once you use all of those fast passes, there are kiosks and/or cast members in the parks at designated locations where you can book additional fast passes. This worked out great for us one day when we booked a character breakfast, did three attractions with the fast passes, had lunch and before heading back to the resort for a mid-day nap/pool session, booked another fast pass for the evening show so we didn’t have to rush back. We knew we had seats waiting for us. It is a brilliant way to manage your time! The Dining Plan – Some people love this, others despise it. It worked magically for us! Each day we had a quick service meal, a table service meal and a snack. You don’t have to use one per day – you can use them however you see fit. We booked character meals and used these as our table service meals. It was great to have the option for the quick service meal because let’s be honest, are you really going to get four kids to behave for two meals in one day? Snacks also count as bottles of water, pieces of fruit or ice cream treats, a win-win for everyone in our party! 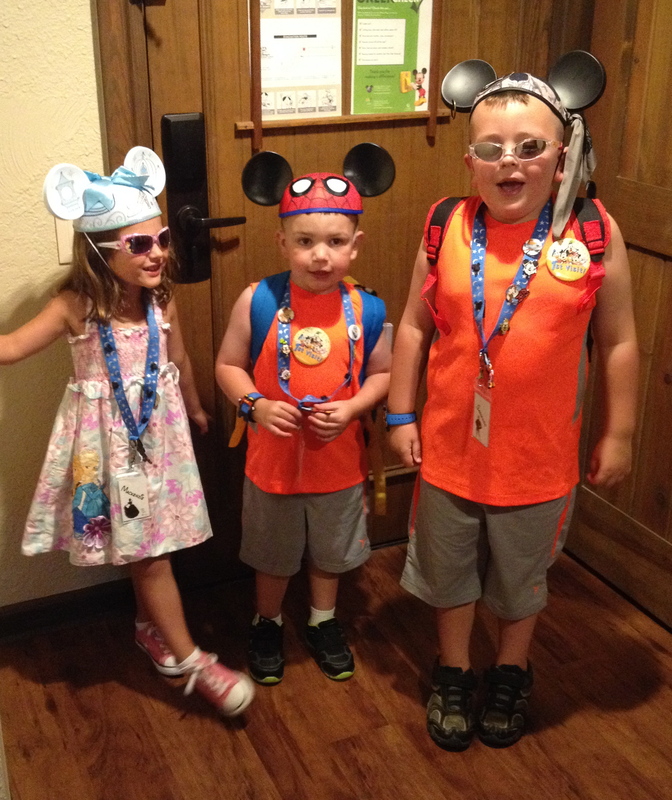 Disney Transportation – Use it! If you are staying at a resort, you can pick up the Magical Express from the airport. You tag your luggage at home, check it at the airport, and then Disney gets your bags for you and transports them to your room! Yes, we checked our bags at Logan and didn’t see them again until someone brought them to our room. Magic!! There is bus transportation to any of the Disney properties, as well as boat or monorail transportation. Most of the time we took a boat from the resort straight to the Magic Kingdom. It was heavenly. I highly recommend staying at the Wilderness Lodge if you are going to spend a lot of time at the MK. At the end of the night when everyone is leaving the park headed to the monorails, the parking lot or the buses, there is only a handful of people waiting to get onto the boat shuttle to this resort. It is one of the best kept secrets at Disney! Stay hydrated! You can bring in bags, coolers, and water bottles to the parks. We brought one cooler bag full of water bottles that we filled with filtered water at the resort. You can also purchase $2.50 bottles of water. I don’t recommend spending extra cash on water, but it is imperative that you and your kids stay hydrated. 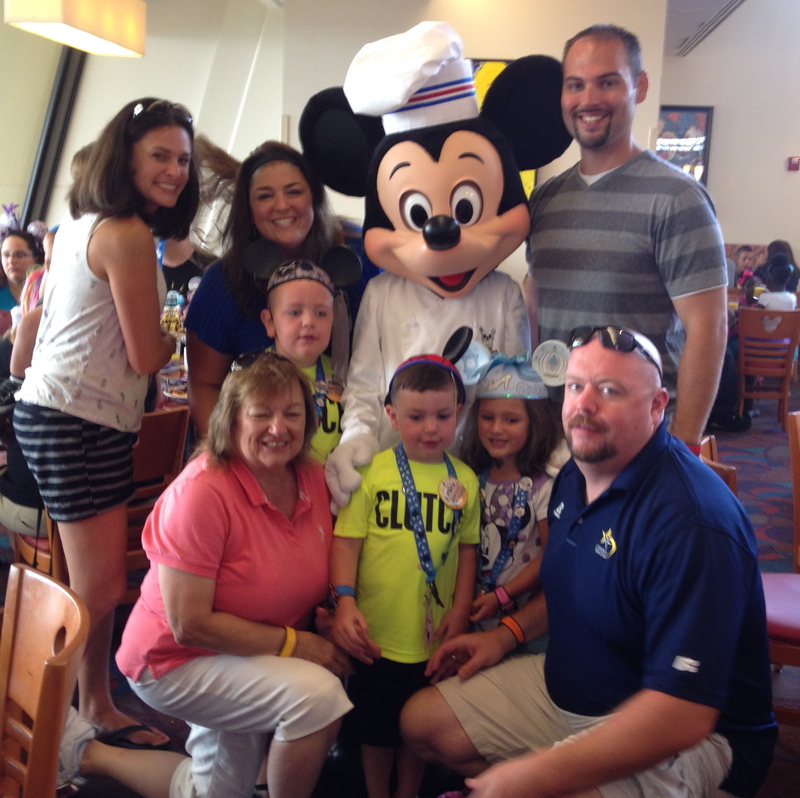 Dealing with a dehydrated child is never a good thing – especially in the happiest place on earth. I hope these tips and tricks help you to plan your next vacation. I’m already set on planning our next one!